The intended YDA-01 | YDA-01B comparison provided a highly illuminating opportunity to juxtapose tubes and transistors from the same designer and with the same front-end circuit. I simply programmed my Esoteric C03 preamp for the necessary level offset to account for the B's higher output voltage. What I found confirmed notions informed by many years of comparative listening to both valve and solid-state designs. Given the excellence of the cheaper YDA-01, the release of the tube version suggested to me that its particular variation on the Yamamoto house sound theme had to still closer conform to the designer's unabashedly thermionic heart—and/or better serve his favored types of music—to have seen the light of day. While a reviewer's personal preferences have a place in the commentary, they should not lead the reader. Listening to predominantly modern music—world, ethnic, ambient, Jazz—I had a consistent preference for the transistor version. 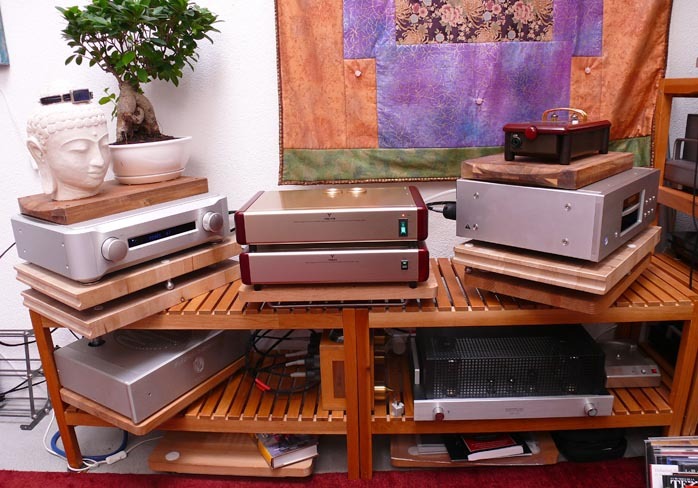 For likely the same reasons, a predominantly classical based listener should favor the tube DAC. The distinctions are a combination of sonic aspects and associated feel or gestalt. Qualitatively, there is no gulf between them. Rather, it's a narrower than expected but discrete gap. Edge definition or image lock is sharper and stronger with the transistors. Relatedly, the sense of grippiness is higher and the perceptional distance to the virtual performers shrinks though their factual locations relative to the seat do not. Invoke qualities such as directness and inner tension and the single-ended transistor circuit had more. Counter with more innate relaxation, a minor shift into watercolor transitions, somewhat bloomier textures particularly in the bass which lost no amplitude and the valves pulled ahead. In matters of hall sound—ambiance, reflections, the audibility of space or halo around performers—the transistors were keener. In matters of elasticity—the sense of float, buoyancy, flow rather than pressure—the small Western Electric pentodes were more willowy/billowy. The transistors had the advantage in resolution and dynamics, this likely due to a lower noise floor. Speaking in generalities only, if modern music is more angular and upfront and classical music rounder and often preferred in the mid or far field, an association of transistors with the former and valves with the latter would be intuitive. It perhaps holds a clue about Shigeki San's e-mail comment which was rendered somewhat enigmatic in the software translation: "We completed YDA-01B 230V review sample, this has evaluation quite higher than YDA-01 in Japan." I deliberately did not inquire whether the "higher evaluation" expressed the designer's personal bias or was based on reviewer, dealer or customer responses. As a confessed tube fancier, I might have been led to concur. 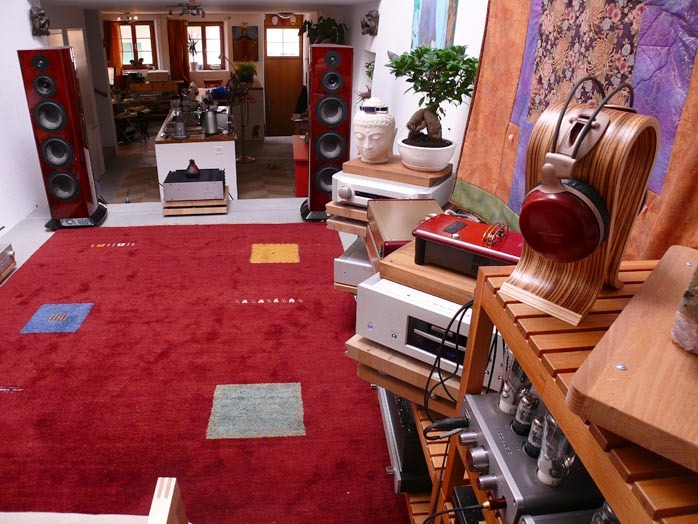 Imagine my surprise to discover that in how I had assembled my system and how my aural preferences had arranged themselves at this juncture, I related more powerfully to the 'original'. From Bratsch to Romane & Rosenberg, Sevara Nazarkhan to Mercan Dede, Paolo Conte to Abed Azrié, Quadro Nuevo to Vicente Amgio, Hüsnü Senlendiriçi to Jan Garbarek, George Dalaras to Sezen Aksu, the sharper transients, higher contrasts and more peppery dynamics had my vote. Switching to The Twinkle of Stars, a Chinese violin/piano outing David Kan had introduced me to on the Rhymoi Music label, the tables turned. The more laid-back politer take of the YDA-01B coupled to particularly richer piano timbres and mellower violin tone closer approximated what I'd expect to hear 15 rows from the stage in a concert venue (and where I'd never clamor for a front-row seat). 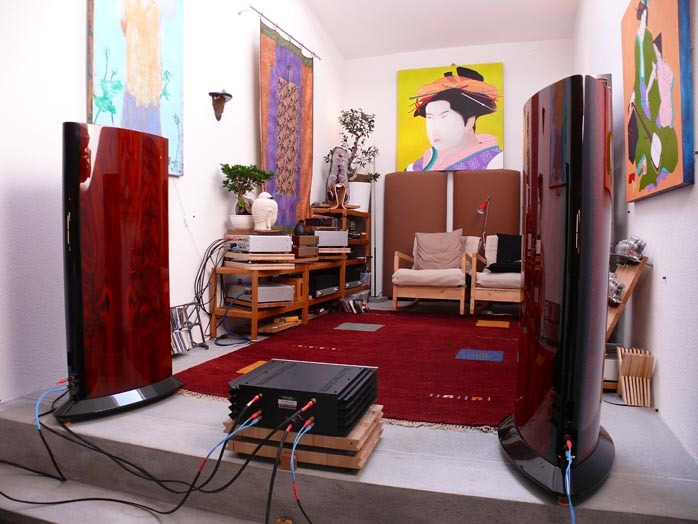 Having owned Yamada-San's Zanden Audio separates and having met the man at numerous trade shows to recognize that his components are voiced like him—not forceful, somewhat reserved, very civilized and sophisticated, bereft of any brashness or aggression—I wouldn't be surprised to discover that Shigeki-San listens to a lot of classical music too but more dynamic large-scale variants than Yamada-San. I say large-scale and dynamic because of the bass power and drive Sir Yamamoto has built into both of his converters. Bass potency is similar to adding more black into a paint palette. It intensifies tone hues for more depth and richness, gravitas and profundity. But it also has the very obvious benefit of capturing the force of massive swells and pounding tympani with full conviction. Drive meanwhile maintains the tension inside long arcs of crescendos and cracks when a percussionist leans in or a slap bassist gets funky. This low-range potency was part of Shigeki-San's original design brief and translates unbroken to the tube version. What changes in that department isn't amplitude but the relative balance between leading edge and sustain. The transistors are more 'front heavy' on the transients, the tubes are busier in the middle portion of harmonic envelope. As already stated, I'm not sure what the "quite higher" statement by the designer implied in who found it so - and what it suggested about perceived performance delta. In the review systems, I found the differences far from drastic but consistently audible to prompt personal preferences. Perhaps most surprising in this context was just how far Yamamoto had already pushed a transistorized output stage into color saturation. Common knowledge would predict significant advances for a tubed output stage. Yet I didn't really find it so. I keyed in primarily to the angular/rotund theme, the inner tension versus flow, higher separation vs. softer transitions, perceived directness/distance. I also found the transistors to offer greater intelligibility at very low listening levels which my present town house rental despite its monstrously thick walls has me exploit a lot in the evenings. To return to the first paragraph above, these findings correlated with my general notions on what tends to distinguish transistors and tubes. Personally more fascinating was the relative narrowness in which these differences played themselves out. While these classes of output devices do have their inherent qualities and effects, a gifted designer not intent on excess can arrive at results with far greater overlap than anticipated whilst preserving the unique flavors of either. To recap in generalities, Yamamoto's transistor DAC favors pizzicato and staccato, the valve DAC con arco. Flamenco guitar vs. bowed violin. The YDA-01 is more primary colors, the YDA-01B more half tones. Impact and follow-through. Excitement and relaxation. Intensity and mellifluousness. Sforzando and rubato. Those are the general polarities overdrawn for clarity. Now move them together closer to eliminate a strict caste system - close enough to move readily back and forth. That's what both separates and connects these two machines. To get mundane for a moment, the ¥/$ exchange on publication date rendered the sell price for a YDA-01B $3,086.25 or €2,114.73 prior to shipping from Japan (assuming your country is without a Yamamoto importer). 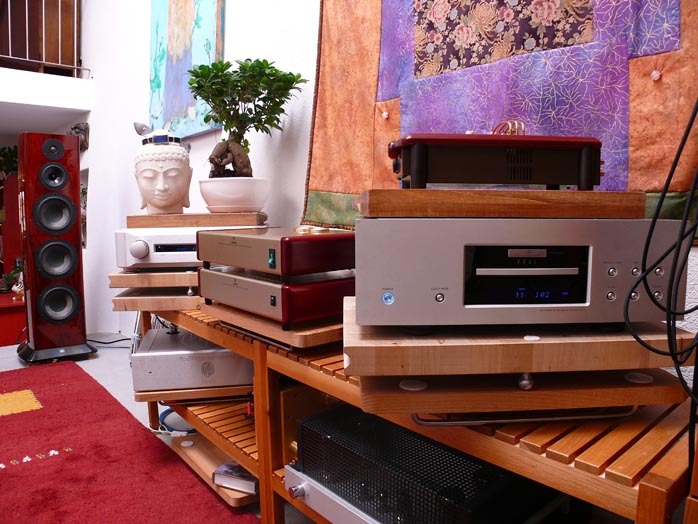 As has become standard operating procedure for this firm—happy news for consumers and far from the norm when made-in-China CD players sell for $7,000 under a Euro or US brand—this is once again exceptional pricing fairness for the country of manufacture and the level of build quality and musical performance on offer. It's outright mandatory then that the YDA-01B share our prior Blue Moon Award with the YDA-01. Think Sicilian Malvasía vs. Cypriot Commandaria. Both are Muscat flavored, rich, sweet and potent desert wines. They appeal to the same general client base but their differences in nose and finish find them different homes on the same page of a spirit seller's customer list. And catching the spirit of things is what these two machines are about. The choice is yours and Yamamoto is to be commended for offering two flavors. Quality of packing: Very good. Completeness of delivery: Includes power cord and product sheet duplicated from its web page. Human interactions: I've always interfaced directly with Shigeki-San and obtained responses in a timely manner. There is a language barrier which isn't completely bridged by his translation software but that is charming, not irritating in the least. Final comments & suggestions: Add USB or Firewire ports. Yamamoto's insistence on not using op-amps in favor of fully discrete circuitry and his fairness in pricing could make him the go-to man for a world-class while still affordable traditional and PC-ready digital converter. I'd buy such a YDA-02 unheard and solely on the strengths of the two 01s.